You saw it correctly! Five FREE books to download with no obligations! Free craft eBooks are the ultimate resource for crafting. Each eBook includes a collection of free craft projects organized around a theme, such as Christmas, Knitting or Low-Cost Kitchen Decorating. You can easily download and print out each book for on-hand reference while crafting. On this page, find our three most recently published eBooks. For more free craft eBooks by category, check out the Holiday Craft eBooks, Thrifty Crafting eBooks and Special Occasion and Seasonal eBooks. Quick and Thrifty Crochet eBook- Find 25 free, easy crochet patterns to create small items in a single sitting, such as dishcloths, flowers and small baby items. These free crochet patterns are great for last-minute gift ideas. 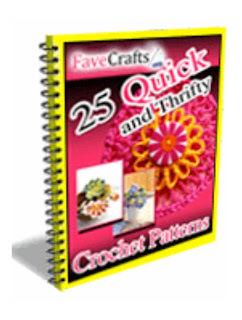 24 Quick and Easy Knitting Patterns eBook- Knit many great patterns for yourself or give as a gift. In this eBook you can find patterns for baby, kids, Afghans, winter gear and more. 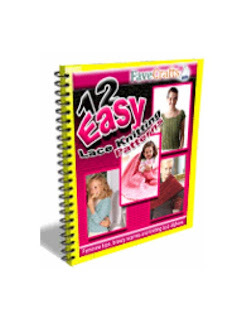 Easy Lace Knitting Patterns eBook- Find 12 easy lace knitting patterns for afghans, scarves, wraps, cardigans and more. Enjoy the elegant side of knitting with intricate, openwork designs. 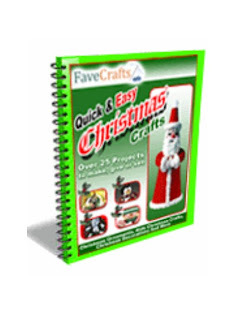 Quick and Easy Christmas Crafts eBook - Find over 25 quick and easy Christmas crafts for ornaments, home decor, kids' crafts, greeting cards and gift giving ideas. Crafts for every aspect of the holidays. Great Gift Ideas: Knitting and Crochet Patterns from Red Heart Yarn eBook- Find 19 crochet and knitting patterns including afghans, scarves, hats, sweaters, bags and more. Find just the right project for your next autumn project. Sewing for Beginners eBook- Find 20 free sewing patterns and great resources for those learning how to sew, including guides to needles, caring for fabric and more. 25 Easy to Make Homemade Jewelry: Quick Crafty and Simple, Perfect for Yourself or Gifts- Find 25 amazing pieces of jewelry to keep for yourself or give as a lovely gesture. E-books are cost efficient because you do not have to pay a big price in order to get one or to publish one. The only vital thing needed for e-books is Internet access. Ebooks are significant to web industries due to its wide reaching applications. Many publishers publish e-books and give them away to prospective customers for free. It is also done usually to enhance their skills and familiarity with their site’s niche or products.